OXFORD, Miss. – As new director of annual giving for the University of Mississippi, alumna Maura Wakefield Langhart hopes to strengthen the Office of Development‘s connection with donors while also working to increase crucial private support. “In the short term, my goal is to modernize our annual giving efforts by increasing our presence online and making it easier for our donors to give,” said Langhart, a 2014 graduate of the UM School of Applied Sciences with a bachelor’s degree in exercise science. Annual giving also enables Ole Miss to connect more meaningfully with its donors as the university gains insight into their unique affinities, she added. At a time when state support helps offset only 12.4 percent of university expenses, private giving can make up the difference, providing support for student scholarships, faculty programs, academic facilities and other operational expenses within the university’s schools, colleges and departments. “Private giving is important for so many reasons,” Langhart said. “Firstly and most importantly, it makes an immediate and lasting impact in the lives of our students and in the value of their degrees. 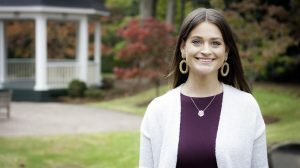 After graduating, Langhart, who grew up near Washington, D.C., remained at Ole Miss as a graduate assistant in the Office of Development while earning a master’s degree in business administration in 2015. She then accepted a full-time position as assistant director of annual giving with the UM Office of Development. In 2016, she joined the staff of Ruffalo Noel Levitz, a national fundraising and donor-engagement company, where she worked as director of client services for two years before returning to the Office of Development in her current position. Langhart brings great value to the development staff and to the university as a whole, said Charlotte Parks, vice chancellor for development. “We are excited to have Maura onboard,” she said. “She is already proving to be a great asset in helping to establish a steady, consistent stream of private support and sharing ideas on how to increase support. In college, Langhart was active in Phi Mu sorority. She also met her husband, Alex, at Ole Miss. The couple married in 2017 and lives in Oxford. To make gifts to the university, go to https://give.olemiss.edu/ for academics, https://www.umc.edu/givenow/ for the UM Medical Center or http://givetoathletics.com/forward-together/ for Ole Miss athletics.